Welcome to First Church of Christ, Scientist, Pasadena. Our church is a branch of The Mother Church, The First Church of Christ, Scientist in Boston, Massachusetts. Our church has been a part of the Pasadena community for more than 100 years. Healing and spiritual growth underlie all of the activities of our church. 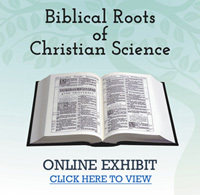 Sunday Morning Service 10 a.m. – 11 a.m.
Christian Science is rooted in the Bible. The heart of our Sunday service is a sermon preached by our “dual pastor,” the Bible and Science and Health with Key to the Scriptures by Mary Baker Eddy. We also sing hymns, pray together, and enjoy a solo accompanied by our world-class organ or grand piano. Our Sunday School is held at the same time, with classes for students from preschool up to the age of 20. Child care is provided for those too young to attend Sunday School. Wednesday Evening Meeting 7:30 p.m. – 8:30 p.m. This is a testimony meeting where those who have been healed in Christian Science, either through their own prayers or with the support of a Christian Science Practitioner, share testimonies and remarks. The meeting also includes hymns, prayers, and readings from the Bible and Science and Health. We look forward to welcoming you, your family, and friends.